A dewy shimmer is fresh, youthful and attainable. A dewy, youthful complexion is yours with the right tools and tricks. The key is to find ways to make your face glow and shine and generally appear fresh. When it comes to skin care and makeup products, less is more. You want to enhance your natural glow without looking like you spent hours in front of the mirror to get this look. Wash and exfoliate your face to remove dead skin cells that dull your complexion. Use a cleanser with alpha hydroxy acids or Retin-A, then follow up with a gentle exfoliant to boost your skin’s glow. 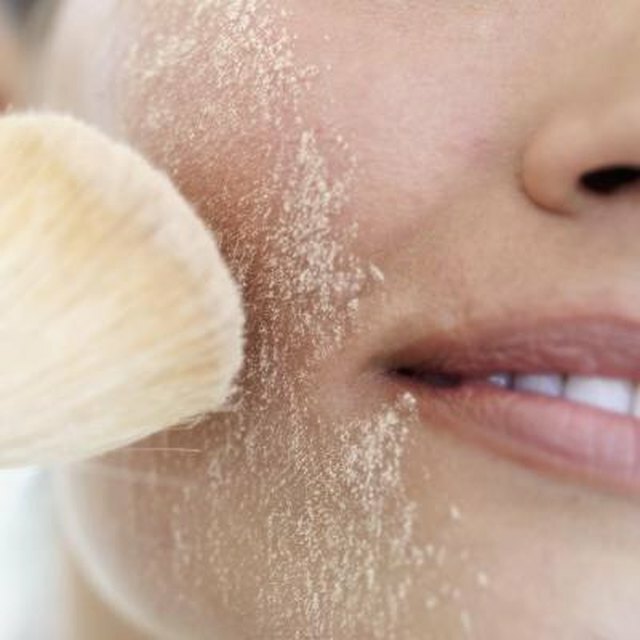 Make a gentle exfoliant with baking soda and a little water, or sugar and almond oil mixed into a grainy paste. Rub gently over your clean face and rinse off to reveal fresh, luminous skin. Moisturize your face before putting on any makeup for a dewy look, because dry skin has no shine at all. Keep it light, as caking on too much moisturizer can sabotage your makeup’s staying powder. A pea-sized amount for your cheeks, then another for your forehead and chin should suffice. Prime your face for dew-enhancing makeup with a shimmery primer, found in many beauty supply stores. Like moisturizer, primer contains light-reflecting pigments to enhance luminosity. Apply as you do the moisturizer and let it set for five minutes to hold makeup in place and keep your look fresh all day. Apply liquid foundation, as powder foundations provide a matte appearance, and use a clean makeup sponge to apply it lightly for a dewy look. Avoid thick foundations that result in a caked-on appearance. Use cream blush to add healthy color and moisture-rich glow. Choose a color that mimics a natural flush, such as peach. Dip your middle finger into the cream blush and apply it to the apples of your cheeks by gently patting it on. Use ring finger to blend it. Stick with a shimmery eye shadow in a neutral, natural tone, such as peach, bronze, beige or light brown. Apply mascara but avoid caking on heavy eyeliner. Set the entire look with some translucent powder. Dip your powder brush into shimmery, translucent powder and apply a light dusting all over your face to help blend and set makeup. Finish your look by spritzing your face with setting spray to give it that final dewy touch. When creating a natural, dewy look, less is more. Don’t cake on a lot of eye shadow colors, eye liners, blush, and avoid darker colors and shades.